You would think this would be the dinner that the kids loved…but no. 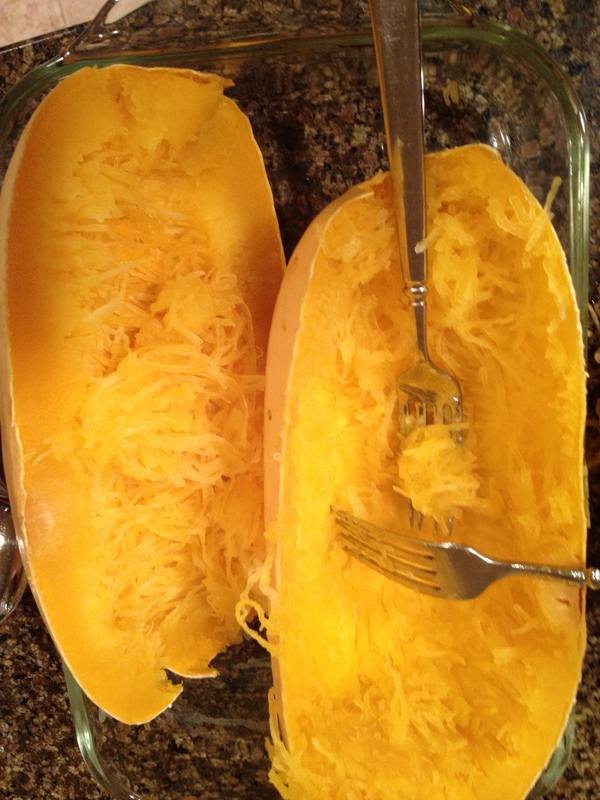 The squash was too different from pasta for them, but they ate decent amounts anyway. In the past I have used shredded zucchini, unheated under simmering sauce (heats up right away in the bowl), with better all around success. 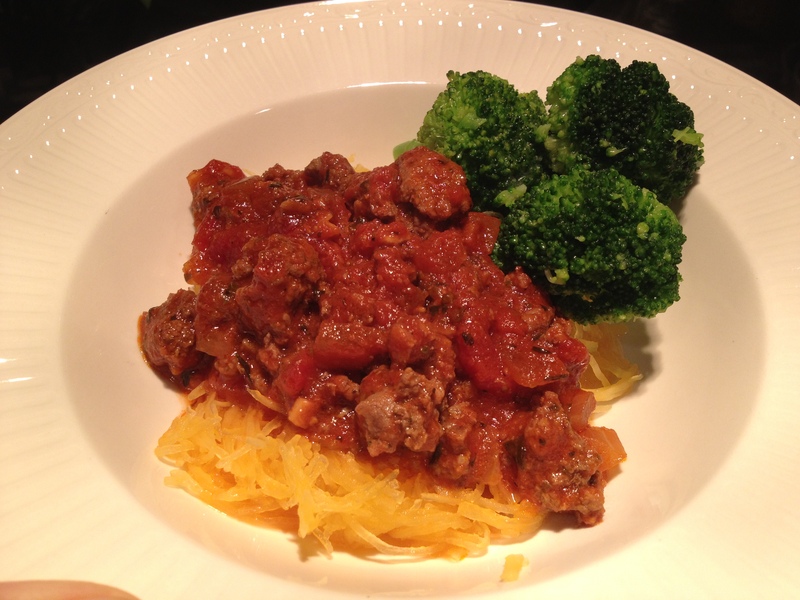 But it’s winter, so we used the winter Spaghetti Squash this week. Preheat oven to 400. Wash your whole squash to remove any dirt. Prick all over with a fork or small knife so it won’t burst while cooking. Place in a pan and bake for one hour. Remove from oven and allow to cool just until you can handle it to cut it in half lengthwise. Scoop all the seeds and pulp from the center, discard. 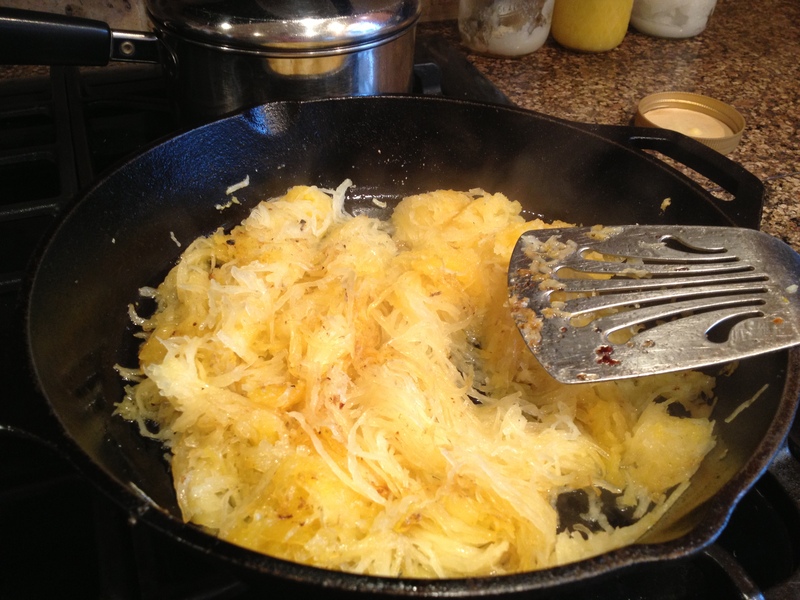 Using forks, shred the flesh of the squash into noodle-like pieces. Serve into bowls and cover with heated sauce. And you thought I was going to give some great recipe, right? Wrong. I try not to make marinara from scratch, certainly not on a weeknight in the dead of winter. In summer, when I have too many tomatoes in the garden, I love to make an easy oven-roasted marinara, but right not, out of a jar is fine with me. There was only one(!) marinara at TJs that didn’t have sugar, soybean oil, or dairy; their Roasted Garlic. WOW! Is that ever a lot of garlic! On weeks when I can get to WholeFoods (never), I like to buy their store brand (Everyday 365?) in the fat free “flavor” because it’s a great basic sauce without nasty add-ins. Simmer 10 minutes and serve over squash.